Club Ride’s fashion-conscious designs combined with functional features and technical material make their apparel something you’ll reach for again and again for adventures on the trail or around town (especially if you work in the outdoor industry). The Outdoor Prolink team tested some of their Spring ’14 product – see what we have to say below. I usually avoid traditional bike shorts at all costs, so the Eden Short is a great alternative. I love the stretch, moisture-wicking fabric of the shorts and they are a lot more comfortable than spandex. I also like that you don’t have to sacrifice performance for style. They come with a removable chamois, so they are extremely comfortable to wear riding. I also really like the 7-inch inseam because it’s a modest length that helps me transition to public places with confidence. 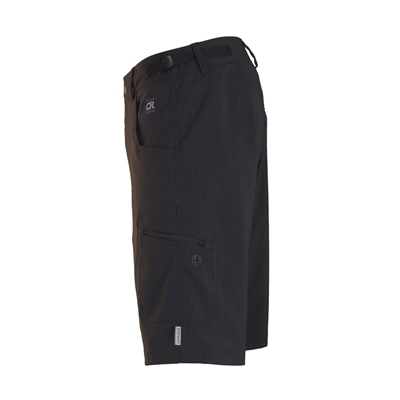 One key feature on these shorts is the discrete zipper leg adjustments which aid in venting and add mobility. I also really love the brushed raven color of the shorts because they give the stylish illusion of being cotton, while still killing it on the trail. The Wheel Clever Jersey is the ideal piece for warm and breezy spring days. I love the gauzy material because not only does it feel amazing on the skin, it’s breathable when the temperature rises. The long sleeves offer necessary sun coverage, and the thumb holes keep them in place. The Henley design with snap buttons embodies the mountain-chic look so desirable in my town, and the wheel pattern reminds me (and the people around me) how damn much I love my bike. The hidden zipper pocket on the bottom hem of the shirt is perfect for stashing a car key when you hit the trail. The shirt comes in pretty off-white and a rich chocolate-brown. I picked up the Jack Tech Flannel to wear mountain biking, but it has really proven useful around town. It looks sharp but is still wildly comfortable – I really love the versatility. As far as first impressions go, I immediately noticed quality of the shirt – both in its material and construction. The design of the piece is clearly well thought out, and I love the details like the pearl snap buttons. It’s also very functional and the mesh pits allow you to get from place to place without being a sweaty mess. I love the pockets in the back of the shirt which are the perfect size for holding keys and a wallet, because pants pockets don’t always do the trick, and I hate carrying a backpack brewery-hopping. The shirt also washes really well and doesn’t involve any kind of ironing like a regular dress shirt – which is perfect for us dirtbags.. because let’s not kid ourselves, the only iron I own is for my skis. The Cargo Away Shorts are a comfortable, functional, and presentable pair of shorts that work well for riding or just wearing casually. My previous non bibs-and-jersey kit was a flannel shirt with some cut-off dungarees, so I was excited to see how Club Ride bridged the gap. One of the best aspects of these shorts is that they don’t have a built-in chamois. If you plan to do a long ride you can throw on a pair of your bibs underneath, but otherwise you can wear them as normal shorts. I have personally never had good luck with baggy shorts that have built-in pads. The waist adjustment is also nice as it has belt loops for regular around-town use and side buckles built-in to synch them down. If you are the type who is prone to forgetting a belt then this is a nice back-up option. As far as fit I am 6’3 with a 30” waist and wore a size small. They fit great for me and were sufficiently long. They don’t ride up or bunch up on the saddle. One small issue was the cargo pocket zipper size. The pockets are great but the zippers are a bit short which makes it hard to get stuff out of the bottom. Overall these are a great pair of shorts. I am looking forward to riding in them all summer and not looking silly at the post-ride coffee stop. I think the best test of casual riding apparel is my willingness to wear it when not on a bike and these certainly fit the bill. Shop Club Ride Apparel on Outdoor Prolink. Not a member? Apply today!